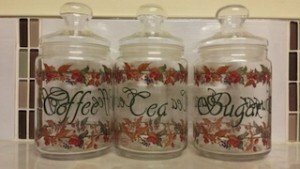 A set of three vintage glass tea, coffee and sugar canisters, decorated with a hand painted leaf and fruit pattern. 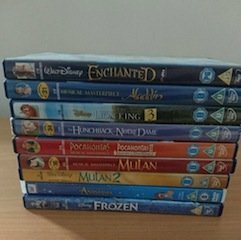 A collection of children’s Disney DVD’s, to include Enchanted, Aladdin, The Lion King, Mulan etc. 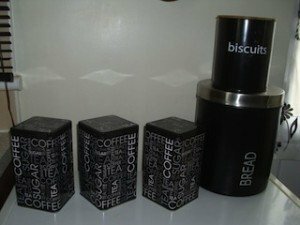 A collection of black and white kitchen canisters, to include a a large circular bread bin, a biscuit barrel and tea, coffee and sugar canisters. 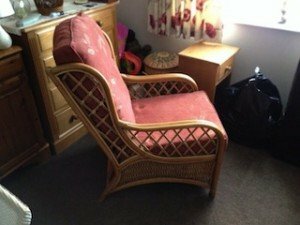 A vintage high back wicker armchair, with removable cushions upholstered in leaf patterned terracotta fabric. 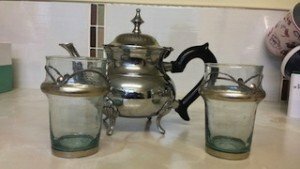 A vintage decorative steel Moroccan teapot, together with two matching decorative glass teacups. 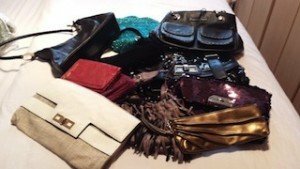 A large collection of vintage and modern ladies handbags, each different colours and styles. 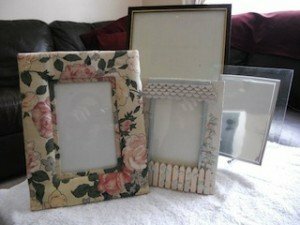 A set of four decorative photo frames, one quilted with a floral pattern, a small shabby chic garden style one, a large black and gold and a clear acrylic frame. 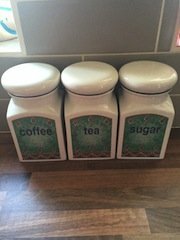 A set of white ceramic tea, coffee and sugar canisters with circular lids, decorated to the front with a green pattern. 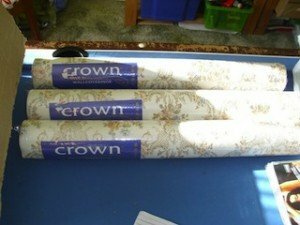 Three brand new rolls of Crown wallpaper, decorated with a gold and blue damask pattern on a white ground. 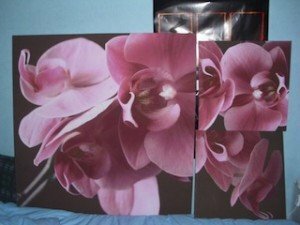 A set of three matching wall canvases, depicting a pink flower against a black ground. 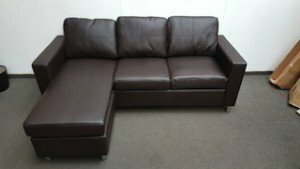 A large four seater low back corner sofa on chrome cylindrical legs, upholstered in chocolate brown faux leather. A tall standing solid wood display cabinet, having two glass inlaid doors opening to reveal three shelves, with a double door cabinet underneath. 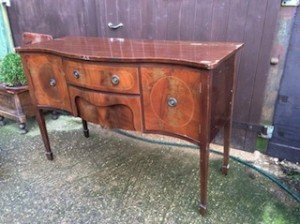 A vintage serpentine large sideboard, having two cupboard aside a small central drawer. 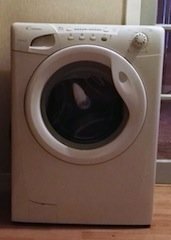 A white under counter Candy Grande GOY105-07S large load washing machine. 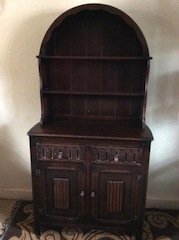 A large Welsh solid wood vintage sideboard dresser, having two shelves above a counter top and two drawers above a double door cupboard. 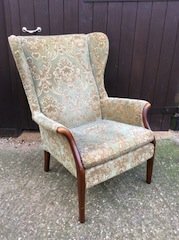 A vintage Parker Knoll high back armchair on mahogany legs, upholstered in damask patterned velour. 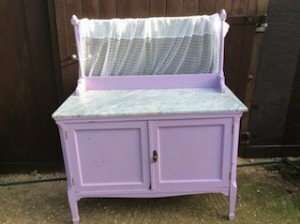 A solid wood double kitchen sideboard hand painted in lilac, having a marble countertop above a double door cupboard. 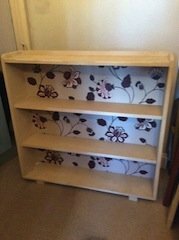 A three shelf hand painted white bookcase in the shabby chic style, decoupaged to the back with floral patterned paper. 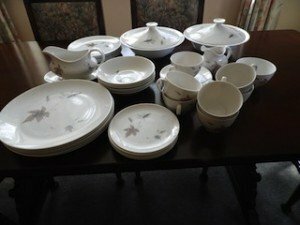 A Royal Doulton dinner service decorated with a tumbling leaves pattern, comprising dinner plates, coffee cups, tea cups, a gravy bowl, a milk jug etc. 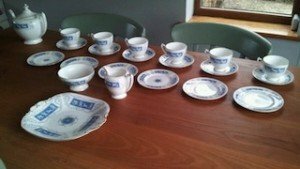 A large Coalport fine bone China tea service decorated with a blue pattern, include a teapot, a milk jug, a platter dish, a sugar bowl, teacups, saucers and side plates.